"• Robust motor housing and gearbox housing. Stable and robust steel gearbox as well as a spindle bearing protected by a metal cap also increase reliability and durability • Ergonomically designed and very slender motor housing provides optimum guidance and handling. An additinal vibration damping ring between the motor housing and rear handle reduces the vibrations • SoftVib handgrip for reduced vibration can be mounted in three positions. • Rear shaft handle with soft padding for secure grip • Switch: with lock-off / lock-on switch • Restart protection after power interruption • Soft-start: for a soft start without power overloading • Spindle lock • Tool-free adjustment of guard. Extremely robust protection against bursting discs • Cutting guard, optional accessory "
"• Max. 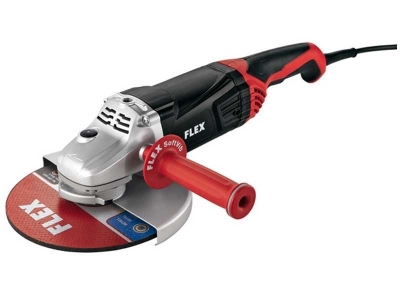 disc diameter: 230 mm • No load speed: 6500 rpm • Power input: 2100 watt • Power output: 1250 watt • Tool fixture: M 14 • Clamping neck Ø: 64 mm • Weight: 5,2 kg"
"1 guard grinding 230 Ø 1 SoftVib handle 1 pin wrench BL 5 1 clamping flange 1 clamping nut M14 "